The message is clear: “the unions are hell-bent on confrontation” – “nothing” will stop them. (Incidentally, the Nov 30th strikes have massive public support according to polls from the BBC, Guardian, etc – but that’s not part of the Mail’s narrative). 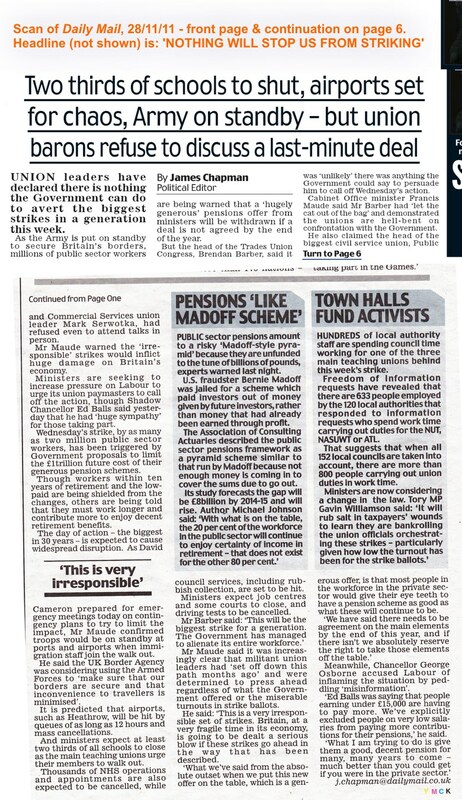 What are the Mail’s statements based on? The report doesn’t mention the source, which is, in fact, an interview with Brendan Barber (TUC head) on BBC’s The Politics Show (27/11/11). Jon Sopel (BBC): Mr Barber we’re about to speak to Francis Maude who is listening to this interview. Is there anything he could say that would get you to call off your action? Sopel: So there’s nothing he can say? Sopel: Mr Barber, sorry to interrupt you, isn’t that a rather extraordinary position that there is nothing that the chief negotiator [Maude] could say here on Sunday lunchtime that would get you to call off your action on Wednesday? Barber: Well, he could certainly have a try… [Barber then outlines the specific policies being forced through by the government, which he wants them to reconsider] … if they’d really take a step back on some of these issues… but having talked to Mr Maude and his colleagues rather a lot over recent months, I fear he’s not prepared to say that – which leaves us with a real difficulty… Unless he comes up with something very surprising then, of course, the action will be going ahead this week. Sopel: (now questioning Francis Maude): Have you got anything to say to Brendan Barber that might avert these strikes on Wednesday? Maude: Yes, I’d say, Brendan, call it off. Now. (Listen to the rest of Maude’s comments, starting after 14m 20s). As I’ve mentioned in previous entries, news frames often provide a narrative with a hero and a villain. This usually boils down to causation in some sense. Who is causing the thing which is making people angry? (And who is trying to prevent that thing from happening?). The “answer” is clear from the Mail’s headline. But since the Mail doesn’t even provide source details, it would be difficult for a casual reader to see that it’s a lie. Update #2, 28/11/11: The online version of the Daily Mail’s headline article (which I also link to above) has been completely rewritten since this morning. The lying headline has been replaced with something about Michael Gove. I’ve scanned the newspaper article, so you can see the original version here. Update #2b, 3/12/11: the online version appears to have been rewritten yet again on 29/11/11, this time with the focus on Ed Miliband rather than Michael Gove. Update #3, 30/11/11: The Sun (on 29/11/11) asked TUC head Brendan Barber to write 200 words on the case for the strike. Apparently it was so good – so convincing – that the Sun wouldn’t publish it. You can read it here.